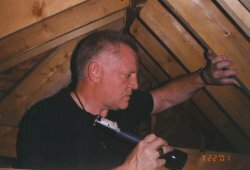 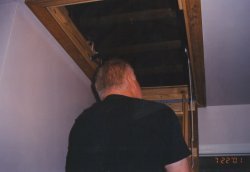 "Scary Stories from the Attic, Part III, by Ron Hungarter.....mold, ventilation, roofing, new roofing tools, do-it-yourself, tools, help, roofers, shingling, roofing tapes, diy, reroofing, layout tape, hand tools, shingled, manufactured housing, modular construction, modular, fiberglass, asphalt, contractors, help habitat, homeowner, DIY, chalk, chalk powder, construction, chalker, magichalk, permachalk, blt, shingles, tape, roofers, roofs, manufacturer, chalkers, shingled, help, equipment, log homes, THOR, free, measurements, builder, builders, chalking, contractor, contractors, lines, reveal, reveals, courses, tip, tips, tool, dormer, dormers, easiest, exposes, exposure, fastest, gable, gables, helpful, hints, hip, homeowner, installer, installing, Kingston, marks, marking, measuring, measurement, newest, safest, striking, string, save, shingling, diy's, new"
At first glance, this beautiful home, built in 1994, appears properly ventilated, right? 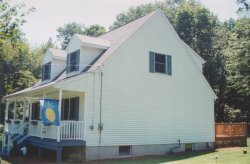 to grow strong on the north side attic area. Delamination is not far behind, if not fixed! 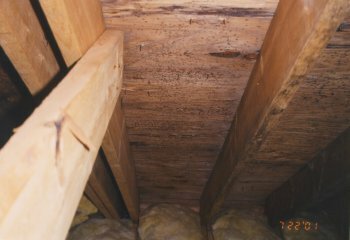 Before you view the photographs below, depicting the conditions I discovered during my inspection, I want you to have some background about the sellers: They are a young couple, a chiropractor and his wife. 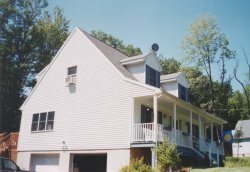 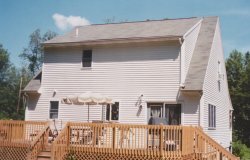 They are selling their home, which they had built in 1996, in Northeastern Pennsylvania, and are moving to Arizona...to get away from their allergies, including mold. 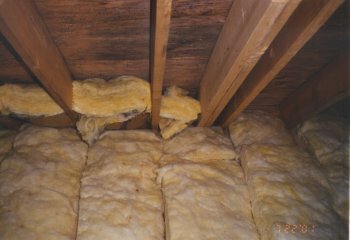 They did not even know they had mold in their attic! 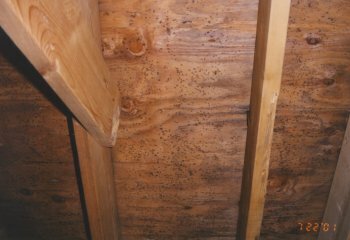 Note: The brownish round spots on the insulation are attic condensation dripping from the rusting roofing nails during cold weather! 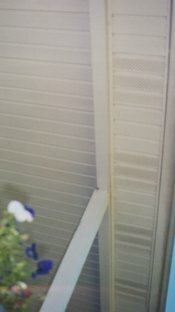 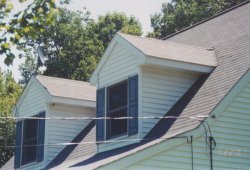 The Fix: Properly install continuous soffit vents and install continous ridge vents!